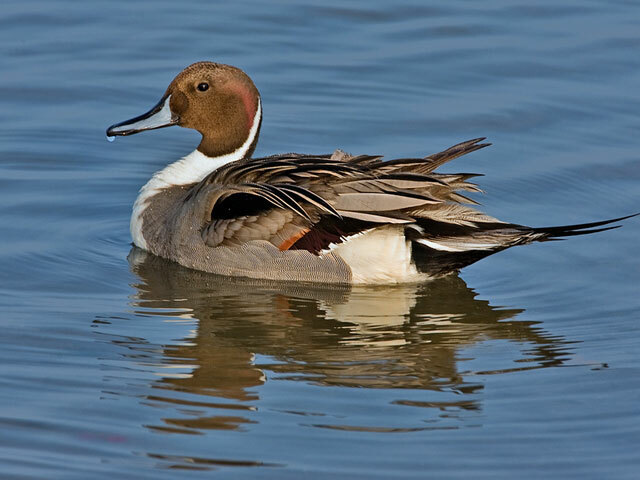 Northern Pintails are slender ducks, having long sharp tail, for which they are named thus. These aquatic birds are at ease on both water and land where they often forage with their uniquely built mouth. Their streamlined bodies help them fly long distances during migration at great speed. They are endowed with unique appearance and quiet nature that makes them highly adorable. They inhabit different geographical regions throughout the world, as they travel extensively during winters. Size: They are fairly big, growing around 60 to 75 cm in length. But the females are smaller, growing only between 50 and 64 cm in length. Wingspan: Their wingspan stretches till almost 27 cm. Weight: Mature male ducks weigh between 400 and 1300 gm, whereas, females weigh between 450 and 1135 gm. Color: Males can be identified by the chocolaty brown head unlike the females that have grey shaded head. White stripes cover the sides of the neck of a male that extends till the white abdomen. Back displays mixed shades of grey and black having white streaks on the sides. Blend of black, grey and white can be observed in their tails that are longer than the females. Upper body of the females is deep brown and the lower side has tints of grey. They are speckled all over with these shades. Bills: Male ducks have blue colored bills and in females the bills are grey. These ducks are prevalent in North America and during summers they are plentiful in Quebec, Alaska and the Great Plains. 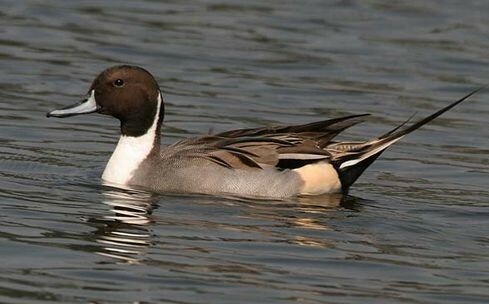 Northern parts of Asia as well as Europe too abound in these Pintails. Due to their migratory nature, they frequent various regions in Central United States and Europe (south). While breeding, they scatter around various northern regions in Eurasia apart from the United States. 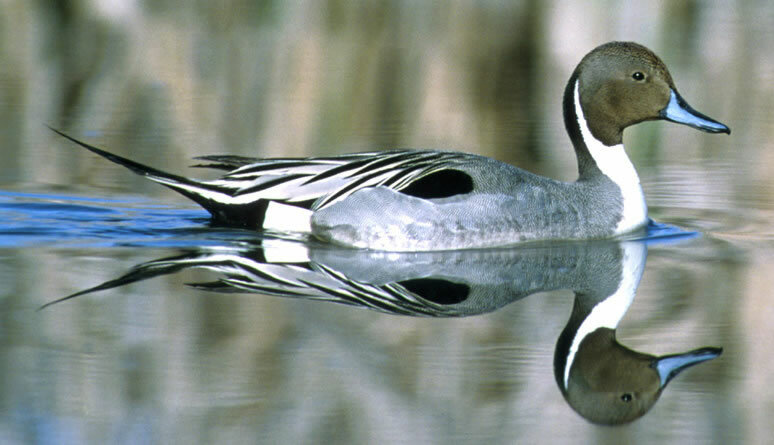 The Pintail ducks are prevalent in marshy areas, lakes and reservoirs, where they get plenty of food to eat. While breeding, they inhabit seasonal and shallow wetlands along with regions in the Arctic Tundra and prairies where the vegetation is lesser. Migratory habitats are also diverse, ranging from inland freshwater areas to other shallow water bodies. A typical shift in choice of habitat can be noted during the nights when they largely prefer thick vegetation instead of wetlands where they frequent during the day. During winters, they usually prefer a range of habitats like, brackish marshes, estuaries and costal lagoons. It is amazing how these ducks traverse different territories during their migratory phase. During winters they can be traced to a number of locations in tropical regions of South Asia, Africa (northern sub-Sahara) and Panama. Northern Columbia, Central America and regions in the Caribbean are regularly visited during the winters. They migrate in lesser numbers to Hawaii. The Northern pintails migrate to India every year, by the month of September and stay till March. During the winters, they are heavily spotted in different northern parts of the nation. During migration, they rest in areas that are protected from strong wind, mostly around shallow water bodies. These ducks have some typical behavioral traits. They team up with other ducks and form huge flocks with them when they are not breeding. The male signals for mating by whistling and approaches the female with his tail lifted up and head lowered. Right after copulation, the males lift their head high following it up with whistles. The females can produce a different clutch of eggs again if the former gets destroyed. 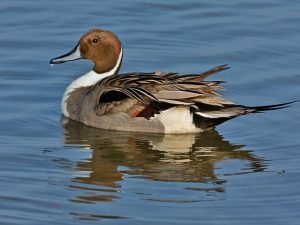 Adult Pintails have a tendency to hark back to their nesting site every breeding season, though they also choose to breed in new sites if suitable conditions do not prevail. On land, they slightly wobble while running or walking around. They are habitually quiet with occasional low pitched whistles or hoarse quacks. This species generally eats at night while swimming or walking in shallow waters. Males leave the females behind at breeding sites to shed off their feathers, which is known as moulting. Moulting happens for a period of 4 weeks and this phase demands them to remain flightless till it is over. 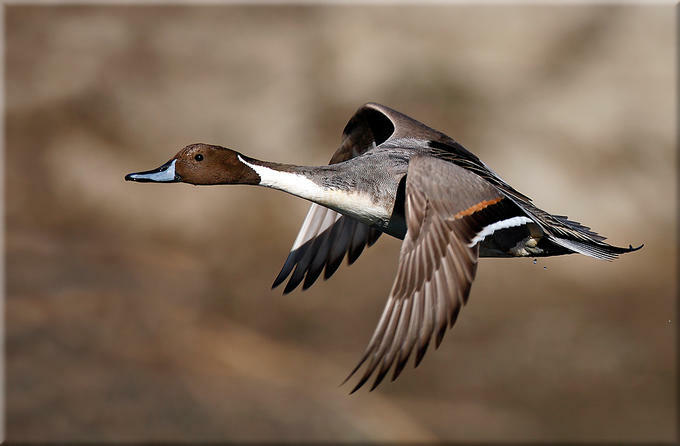 These pintails derive nourishment from plants as well as animal matter, though largely it is plant-based. They generally forage in freshwater but also come on land to eat roots, wild rice, seeds and grains. In the winters, they survive largely on water plant’s rhizomes and seeds. While nesting, these birds prefer eating different types of invertebrates like mollusks, water insects and crustaceans. They get their prey from the water surface in shallow marshes and ponds. They have a distinct pattern of hunting their food from the muddy floors of the water bodies. A distinct pattern of call can be noticed in both the sexes. Females quack in rough tones but males whistle in soft tones. Voice of the female resembles to that of a Mallard. For mating, males give out high pitched “zoeeeeaaa” calls. Juveniles are highly susceptible to dangers as they cannot fly away to save themselves from the predators. Not just because of other bigger birds, foxes and bobcats, these juveniles are also at stake due to parasite attacks and avian flu. However, lives of the flying adults also face threats from falcons and large birds like Northern Goshawks, who can grab them in motion. A majority of deaths are caused by lead poisoning, as they are targeted by game hunters. Several adaptive features help them survive in the wilderness. Secondary and primary feathers help them lift their bodies and fly smoothly. Due to their migratory pattern, excessive oxygen is demanded by their bodies to thrive through migration, which is supplied by its power packed respiratory tract. Bill structure and features inside their mouths enable them to locate, manipulate and filter their food from the depths of water. These ducks take off swiftly and look gracious in flight, which is steady and fast. With the beginning of mating season, from April onwards, the males display certain behaviors like preening and whistling, to secure the female’s attention. Months from April to June are crucial breeding months. These birds attain sexual maturity at the age of one and then onwards participate in the act of copulation, which happens in water. Around 8 to 9 olive colored eggs are laid by the females that they incubate for a certain period, alone without the male partner. At the birth of the hatchlings, the mothers introduce them to the adjacent water bodies and help them feed at the surface. They can re-breed during the season if they suffer losses of the first brood. Breeding sites comprise open regions with a water source close to it along with some vegetation. Swamps, marshes, bogs and slowly flowing streams are ideal for it to breed. Normally eggs are laid in nests tucked away in vegetation, devoid of nearby water source. After an incubation period of 3 to 4 weeks, hatchlings break out that are being taken care of by the mother till they learn flying in the next 47 to 50 days. On an average they may live for 20 years in captivity but in the wild it might be lesser than that due to the constant threats. Housing: Large water bodies might be excellent for keeping them as pets. Feeding: You can feed them with seeds, roots and mollusks from time to time. Care: The idea of tying their wings is inhuman which can be replaced by tying a very long chain on their foot to restrict them from flying away. This should be long enough for them to move around and fly to the nearby branches. They have been considered as Least Concern species by the IUCN. Its existence in North America is closely scrutinized by the North American Waterfowl Management Plan due to an impending threat from game hunters. Sum up some very interesting facts about these gracious birds. They have earned the title of “nomads of the skies” due to their extensive migratory routes. A distinct species of the ducks have evolved in some of the islands in Indian Ocean, known by the name Eaton’s Pintail. In North America, they are one of the species of ducks participating in early nesting. They fly swiftly at high speed, which often becomes the reason for their death at the hands of game shooters. The mothers can adopt various tactics to safeguard her brood from the advances of the predators. Females have the upper hand while choosing her mate from the number of males engaged in mating rituals. Northern Pintails are beautiful birds known for their majestic disposition. Sailing in the rivers they exhibit amusing behaviors, during mating season. These fast-flying birds become very chirpy with their distinct calls. 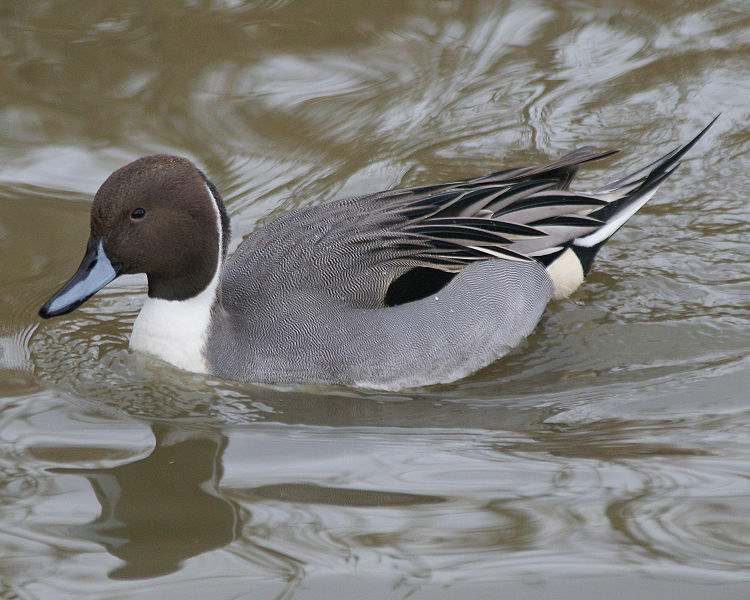 Some of the images of the northern Pintail will help you notice them in the wild.